Currently a Distinguished University Professor at both the University of Maryland and at Johns Hopkins University Bloomberg School of Public Health, she has spent her career working as a researcher, educator and leader within the science sector. Her cholera research has spanned the globe from the Chesapeake Bay to the developing world, concentrating on locally based, inexpensive filtration methods to produce safe drinking water. 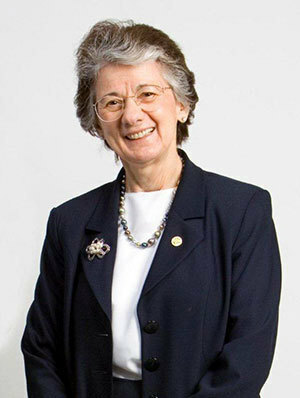 Named the first woman to direct the National Science Foundation (NSF) in 1998, she led that organization through 2004, with a focus on expanding K-12 science and mathematics education, graduate science and engineering education and increased participation of women and minorities in science and engineering. After completing her term as director of NSF, she joined Canon Inc. to help establish Canon U.S. Life Sciences, serving as chairman and chief scientist. In 2006, Colwell was awarded the National Medal of Science by President George W. Bush. She is the recipient of many other awards, including the 2010 Stockholm Water Prize; the Order of the Rising Sun, awarded by the emperor of Japan; and the National Council for Science and the Environment Lifetime Achievement Award. In 2008, Colwell founded CosmosID Inc., a genomic big data company that focuses on rapid identification of microorganisms for infectious disease diagnostics, where she is currently the chairman and global science officer. A highly sought-after counselor on science policy and education matters, she has held advisory positions within government, nonprofit science policy organizations, private foundations and the international scientific research community. The author or co-author of 17 books and more than 800 scientific publications, she has been awarded 61 honorary degrees.